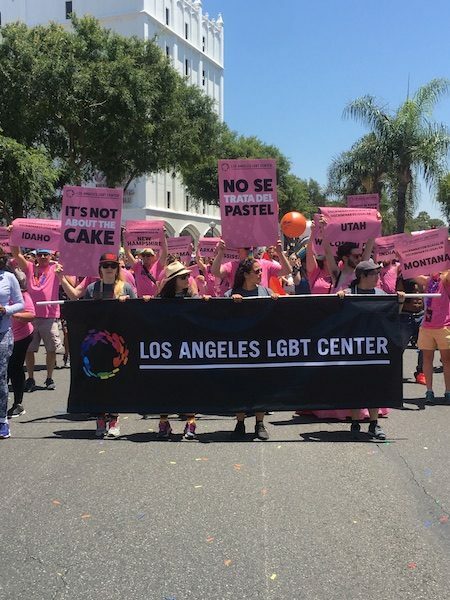 The 2018 LA Pride Parade in West Hollywood returned to its customary format of celebrating the LGBTQ community Sunday after a one-year switch to what was dubbed a “Resist March” to the Trump Administration. A crowd estimated at about 150,000 was on hand for the 11 a.m. parade and ensuing events. The parade route started at Crescent Heights Boulevard and will continue west along Santa Monica Boulevard to Doheny. An assortment of floats conveyed the theme of the festival #Justbe, according to Shayne Thomas, marketing and communications lead and a board member of Christopher Street West, the nonprofit organization that produces the festival and parade. “#Justbe is a deeply personal invitation for self-expression that, we hope, will empower members of the LGBTQ+ community — as well as our very important straight allies — to embrace, embody and express what pride truly means to them in the rawest, most authentic ways possible,” Thomas said. Parade entries featured a multi-color “Lifesaver” bus from the AIDS Healthcare Foundation intended to promote condom use to prevent HIV, the virus that causes AIDS, and to curb other sexually transmitted diseases. 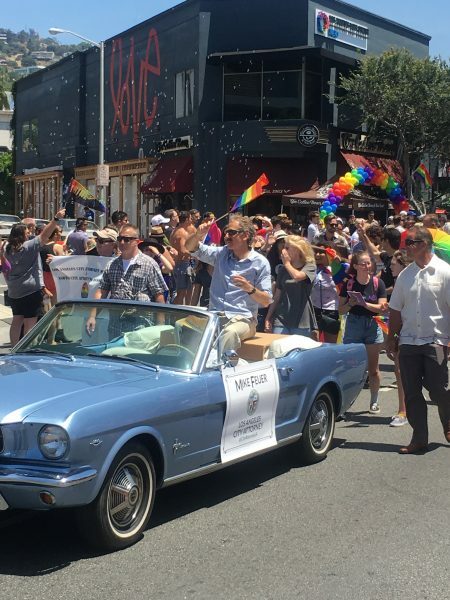 Also participating in the parade were U.S. Rep. Adam Schiff, Assemblymember Richard Bloom, Los Angeles Mayor Eric Garcetti and newly appointed LA Police Chief Michel Moore and L.A. County Sheriff Jim McDonnell. There was a float carrying members of the West Hollywood City Council and city advisory boards and commissions. The parade was dominated largely by floats from corporate sponsors such as Wells Fargo, Walt Disney and Nordstrom but also included participants from local non-profits. The grand marshal was Michaela Ivri Mendelsohn, a transgender activist and CEO of Pollo West Group, one of the largest franchises for the El Pollo Loco restaurant chain. The parade had its traditional moment of silence at noon “to remember those who are no longer with us, or cannot be here today, to celebrate those who fought for pride and the freedoms we now enjoy and to think of those who cannot celebrate pride and remain oppressed,” organizers said in a joint statement. The parade was first held in 1970 in Hollywood, where it stayed until 1979, when it moved to West Hollywood. This year’s success in turning out a crowd is something of which we should be proud. Sure, they vastly underestimated the number of people who would show up, but just look at the unprecedentedy small crowds 2016/2017. Given the numbers from those 2 years, the fact that CSW dramitacally underestimated this year’s turnout is very understandable. The aforementioned small crowds in 2016 & 2015 were primarily the result of major & unforeseen events. The shootings in Orlando occurred DURING pride weekend. This resulted in many possible attendees being too frightened to even show up. Recall that there were two individuals arrested for plots which specifically targeted LA Pride. CSW, WeHo, & much of the LGBT community was in panic mode. I actually saw armored vehicles around town including one on my street. 2017 wasn’t any better. The nationwide Resist March created a direct conflict with our Pride. While CSW did have advance notice of the conflict, this didn’t occur early enough in the planning stage to make major changes to the festival side of the events. Deals were done and contracts were signed. In retrospect, their decision to replace the parade was a VERY bad choice. Still, they lacked the time to really consider the best response and the decision triggered major backlash. Between this and other poor decisions, Pride 2017 completely fell apart. This year, they had the complete opposite problem. Can you really blame them for underestimating turnout after two dismal years? I also wouldn’t be surprised to find out that CSW simply lacked the funds to pay for a larger event upfront. They lost a significant amount of money due to the failures of the past two years. On top of a literal cash shortage, other sources of income would be substantially reduced. For example, advertisers and sponsors must have been harder to find & expect to pay less which is a major source of cash on hand for expenses which must be paid for in advance. I’m not saying that CSW doesn’t have a lot of other problems, some of which compromise the trust placed in the organization. Still the issue of overselling the event shouldn’t necessarily be seen as a complete failure on CSW’s part. What will happen next? CSW will issue a lot of refunds to those turned away, whether they like it or not. Hopefully, the additional revenue earned due to higher turnout and a smaller budget will give CSW the resources needed for a larger event next year, even after the refunds. No matter what, sponsorships and advertising revenues will be much easier to obtain in 2018. Hopefully, this can result in a festival which adequately accommodates the actual turnout. In the end, we will only be able to determine the degree to which CSW screwed up once they publicly release the actual numbers. I’m sure this web site will demand at least this much. So the world didn’t end for us under Trump after all!! Learn anything people? Stop listening to CNN and start thinking for yourselves. Trump is for everyone. The MSM is conning you. Watch Fox and see the truth. Always question what you hear and look for confirmation.